2018 Toyota Camry V6 SL and Camry Hybrid. | | A Wheel Thing. 2018 Toyota Camry V6 SL and Camry Hybrid. Car reviews are always a personal point of view. People have a love for a brand and that’s personal. 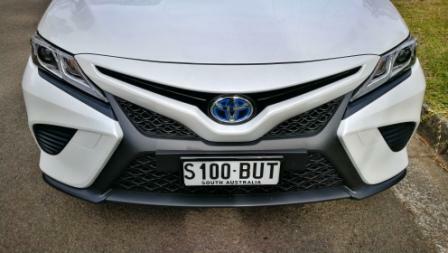 Toyota has that brand loyalty and it’s won them millions of customers over decades. 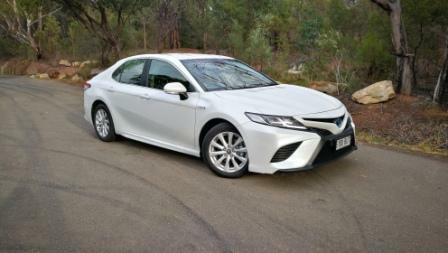 Toyota’s Camry is a big part of that loyalty here in Australia and we first saw it as a five door hatch somewhere in the 1980s. The mid noughties saw the V6 Camry reborn as the Aurion and was sold side by side with the four cylinder and hybrid Camrys. Now, in 2018, we’re back to no Aurion and a V6 Camry. 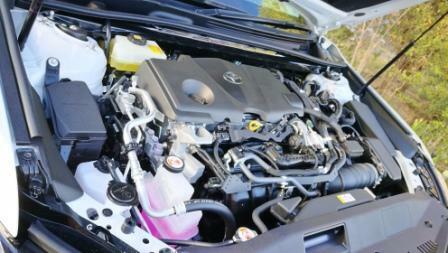 One of those, the top of the range 2018 Toyota Camry V6 SL trim spec, with barely two hundred kilometres on the clock, graced the AWT driveway. There’s also a Hybrid version that sits above the Prius range and below the similarly styled Lexus offering. 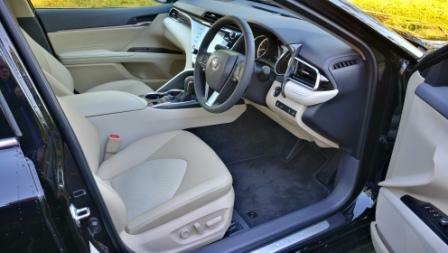 Exterior and interior styling are strongly reminiscent of Toyota’s luxury brand, Lexus. Tweaked for Toyota’s audience, there’s sharply angled headlights with LED lighting at both ends on the V6, standard globes for the Hybrid, a full length glass roof with sunroof offered for the full petrol car, and an almost coupe rear roofline. 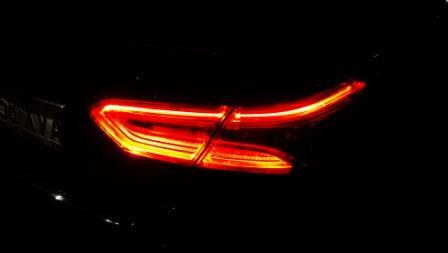 There’s aerodynamic strakes on the wing mirrors and embedded in the rear light plastics. The boot itself has a designed in extended lid that doubles as a spoiler. It’s perhaps the front end that brings a Spock like raised eyebrow, with a twin level V that stretches from each side to meet at the (blue hued on the Hybrid) Toyota logo. Inside it’s strongly Lexus, with multiple dash folds, a beige and black trim combination in the V6 car supplied, some buttons too easily hidden by the steering wheel, and a disturbingly cheap look plastic on the centre console compared to the rest of the interior. 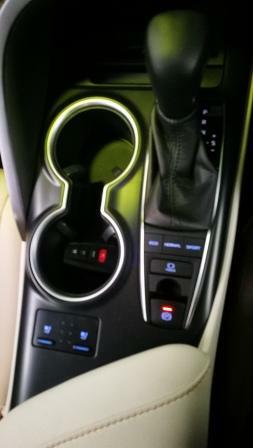 The dash design is an S shape line from the driver’s binnacle that winds down to finish near the passenger’s knee. Leg room isn’t an issue though, nor is cargo space. 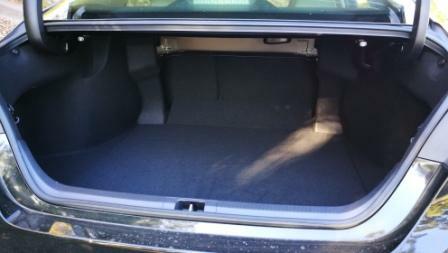 The Hybrid has moved the battery pack from the boot to under the rear seats, giving a full 524L of space. With a 2825mm wheelbase, an increase of 50mm over the outgoing version, front and rear leg room is more than adequate for intended passengers. What isn’t is no USB ports for them in the Ascent, that’s left for the SX and SL to deliver. Up front is a easily spun 3.5L V6. Peak power is 224 “killerwasps” at a almost stratospheric 6600rpm. 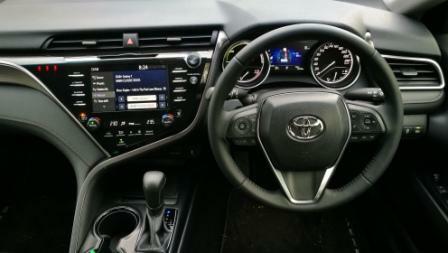 Peak torque is 362Nm at a more typical petrol rev point of 4700rpm with quoted economy of 8.9L/100km for the combined. This is quite achievable in real world driving but utilise the spirited V6’s revving ability and that figure goes south and quickly. Power is put through to the ground via an eight speed auto connected to the front wheels. It’s not the most refined eight speeder around, with each change regardless of throttle position having the body rocking back and forth in sympathy. Compared to the super smooth nine speed in the ZB Commodore tested immediately before, it was almost harsh in its changes. The Hybrid counters this with a combined total of 160kW however this is less than the full capacities available from the petrol and battery system separately. The four is a 2.5L unit with 131kW and 88kW from the electrical side. Transmission here is a CVT and rarely does it feel out of step with the drive-train. It’s also a combination that equals the urge of the V6 when pushed, will quietly hum away on a (very) light throttle, and will pick up its side skirts and bootscoot away rapidly anywhere in between. 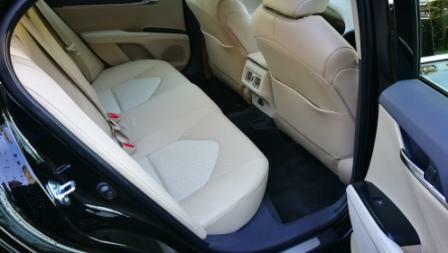 Economy is quoted as 4.2L/100 km of 95RON or E10. AWT saw a best of 5.0L/100km and that was on a fuel sapping run to Canberra and back. The tank in the Camry seems to be of a V shape, meaning as the fuel level lowers the trips towards half, quarter, empty become quicker. Camrys have, somewhat fairly, been tagged as whitegoods on wheels. There’s little engagement, they’re designed to move human bodies from A to B and back again without issue. And these two do. If the word fun can be injected into these two, it’s the Hybrid more likely to do so but only just ahead of the V6, in a driver’s sense. A niggle with the Hybrid that AWT has had is the all too quick engagement of the petrol engine to supplement the battery system. 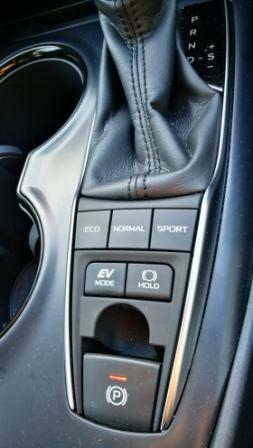 On a flat road and with an eggshell’s pressure on the accelerator, the Hybrid will move away under battery only up to a point where the computer, regardless of whether EV has been selected via a button in the centre console, brings in the petrol engine. A dash screen on both allows varying info such as navigation, audio, and in the Hybrid, shows the power distribution and battery level. It shows the change between battery only, both, or when the petrol is driving and charging the battery. 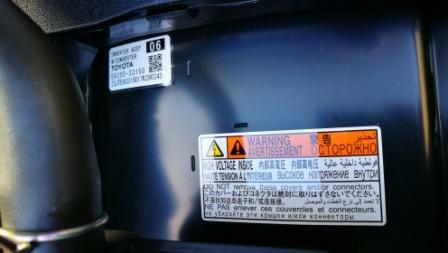 It’s here that faint thunks from the CVT as it deals with the changing drive inputs can be felt. 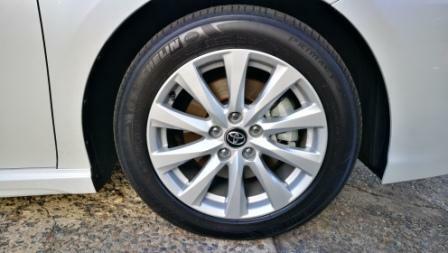 Road holding in a straight line shows that the Camry V6’s rear end is too soft. 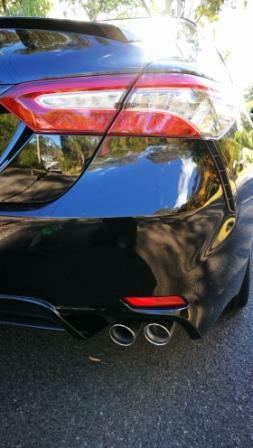 Every minor ripple set the Camry’s rear bouncing, and more often than not a good dip would have it on the bumpstops. The front was defineably tauter, with the same bumps that had the rear flustered consigned to a mere bump. 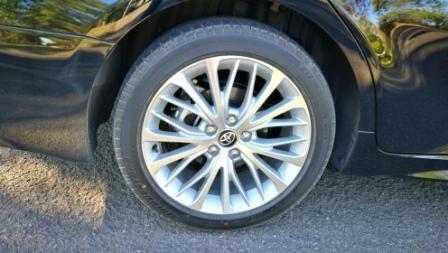 Combined with a V6 and front driven wheels, a heavy foot will also induce a phenomenon rarely seen in cars nowadays. Torque steer. Some plough-on understeer was noted as well with Bridgestone Turanza 235/45/18 rubber not seemingly up to the task. Another disconcerting suspension issue was the readiness of the rear end to skip sideways when on a turn and hitting even a small irregularity. 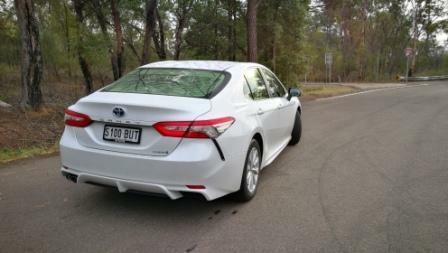 Somehow, the Camry Hybrid felt better sorted at both front and rear. Float was reduced, turn in was crisper, there was a lesser feeling of understeer, a minimised lateral movement and compression at the rear. Ride felt more confident, perhaps thanks to the Michelin Primacy 215/55/17 tyres. 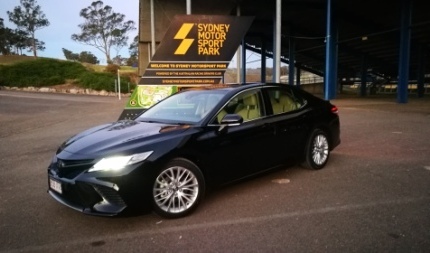 Even in the rainy periods that struck Australia’s most populous city during the test week, the Hybrid gave a more composed and sedate performance on road, instilling a higher level of confidence. Features wise there’s plenty. DAB audio is in both and the model dependent varying sized touchscreens are easy to use although have a pre-programmed split screen look. Default mode has a map on two thirds and audio on the other third, however the soft touch Audio button then brings up the chosen source. 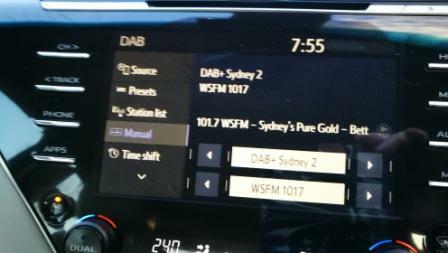 Apple CarPlay and Android Auto aren’t installed but a connected smartphone allows music apps to be used. There’s a charging pad for compatible smartphones snuggled in under the lower dash fold, next to a 12V and USB/3.5mm socket connector. The tiller has tabs on the left spoke that allow access to the dash screen. 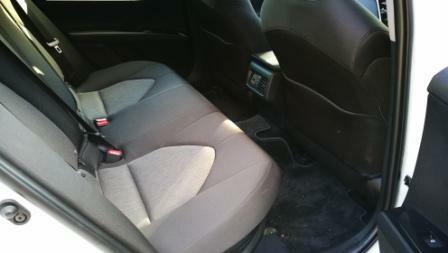 Cupholders front and rear via the console and pull-down are in, as are door mounted bottle holders. LED lighting is featured and the glass roof in the V6 was simple to operate via the standard roof mounted toggles. 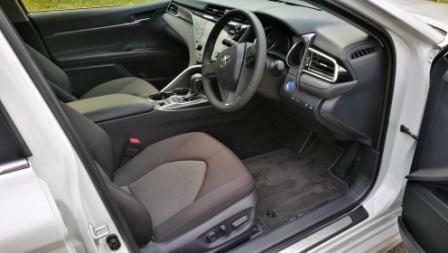 Airbags (seven, including kneebag) and driving aids abound, with the Hybrid having the drive mode options in the console. 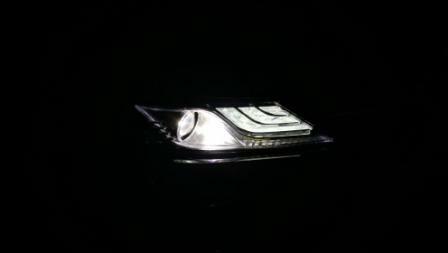 The SL trim level has a Head Up Display which is discrete to the point it’s almost unnoticeable. Park Assist front and rear is fitted and it’s a doddle to use. Reverse parking comes with a camera and guidelines on the screen to help in tighter car park and roadside kerb parking. Blind Spot Monitoring and Rear Cross Traffic Alert is SL specific. The cars themselves will sell to the Toyota faithful and potentially steal a few from elsewhere. Pedaled hard the Hybrid edges ahead of the V6 purely on driveability, is definitely more economical, and in SL form they have a goodly range of kit. From a driver’s point of view however there still doesn’t seem to be a real level of engagement, that sense of momentary flutter when getting in. For AWT it’s perhaps the somewhat disjointed looking dash design and the V6 SL’s lack of real ride as opposed to what a free revving V6 engine offers. 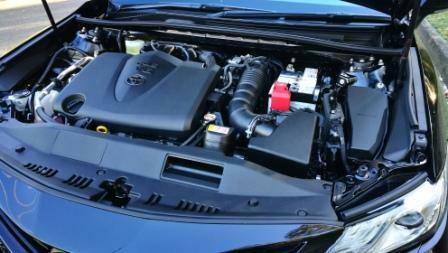 That’s possibly best left to the V6 SX for those that want a rorty and sporty Toyota V6 Camry. Be the first to comment on "2018 Toyota Camry V6 SL and Camry Hybrid."